In case you were worried about a shortage of cooperative beat 'em ups on the market, Rake in Grass has got you covered. 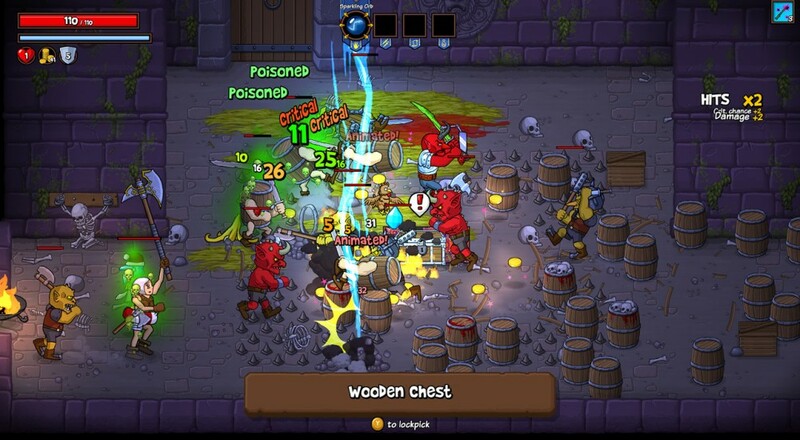 Fresh out of the oven is Rampage Knights, a randomized dungeon crawling action game that lets you and a buddy explore and fight from morning 'til night with more items, spells and enemies than you can shake a sword at. Rampage Knights' setup puts you in the shoes of a hero thrown into a magical forest and trapped there by some sort of spell. Every path you take leads to a ruined castle, so, you know, that's where you go. Inside are innumerable goblins, skeletons, and other foul beasts, as well as innumerable weapons, spells, and items. Descend deep into the labyrinth below as you conquer room after room of baddies using nothing more than... well, tons of items, but don't think it's going to be easy! Rampage Knights supports co-op for two players both locally and online, making it pretty easy to grab a friend and go on a bloody adventure. If you can't, the solo campaign is still a great run. Dozens of spells and weapons are waiting to be found in the game's randomly generated environments, and your hero visually changes with each upgrade. Top that off with full controller support and you've got the makings of a fine rogue-em-up tribute! Rampage Knights is currently available for PC and Mac via Steam.